Right, so this review is going to be a bit different. It’s a two-pack, so I’m going to review each toy individually, then have the ‘price/value’ and ‘overall’ bits at the end. With that said, though, someone in Hasbro’s marketing design must be doing something insane for these series of store exclusive two-packs. One of the toys in them is a repainted legends class toy from past movie lines, which is fair enough – we haven’t gotten the ‘old’ legends/legion class toys since Cyberverse disappeared alongside Prime. The other toy, though? Repainted Beast Wars toys representing the Dinobots. Because Hasbro is so wonderfully bonkers. Beast Wars toys, with some of the moulds approaching ten years. 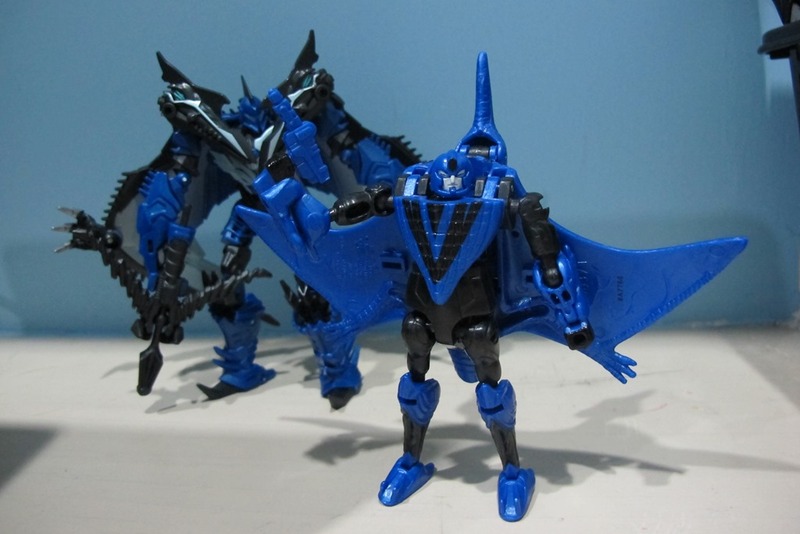 To Hasbro, Strafe is a dark blue pteranodon, because silver is just uninteresting… and I don’t blame them. I’d rather look at colourful dinosaurs than four or five that’s just all silver and grey and blah. 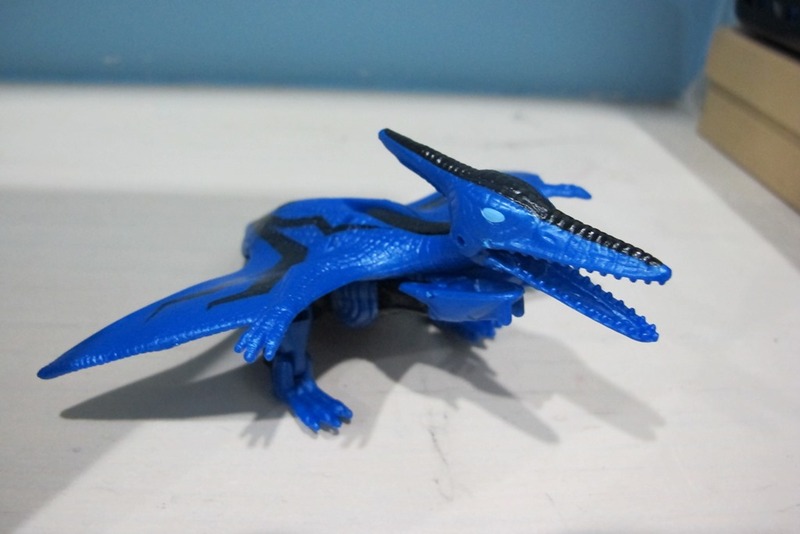 So when they perused older moulds to repaint as Strafe, for whatever madness they picked Beast Wars Terrorsaur. It’s widely considered to be among the best toys in Beast Wars’ first year, if not in the entire line, and I have always salivated over its robot mode for years. So now having him in hand, what do I think of him? Strafe transforms into a pteranodon, and like all Beast Wars toys, his beast mode is supposed to be organic. At first glance, though, you can tell that Strafe’s disguise is not foolproof. His dark blue-and-black paint scheme may help camouflage it a little, but it’s obvious that Strafe has a pair of robot legs running on his belly, ending a bit under his neck. It’s pretty obvious and a bit of a distraction. Still, other than that he’s a pretty impressive little pteranodon. Sure, he’s got larger teeth than the fine comb-like structures that pteranodons are thought to have, but Strafe is a Dinobot! It’s totally justified. Strafe is mainly a dark shade of blue, with black markings running through the center of his head and spine, and making some kind of tribal design throughout his back and wings. The general feel of the look definitely feels reptilian, the people in charge of Beast Wars moulds have certainly put in the effort to make Strafe’s texture look like a representation of an actual animal, and in this case it does look rather leathery. On the underside you can see a bunch of moulded veins as well. Sure, proportionally speaking Strafe’s wings are on the tiny side, but maybe he just had the misfortune of scanning a juvenile specimen? Strafe’s articulation here is not bad either. His beast head is hinged in the neck and in the jaws, independent of each other. His legs nominally attach to recessed parts on the underside of the wings, but they have a fair range of wiggle room both on the ‘knee’ and the ‘ankle’. Overall, there’s really not much to say about the pteranodon mode. It’s a cool little dinosaur, but considering the fact that it makes no attempt to hide the robot legs, definitely the weaker of the two. The robot mode is where it’s at, though. Transformation of the first year of basic class toys are all spring-based, and Strafe is no exception, though his is more akin to an automorph gimmick than strictly a spring-based thing. Moving the beast head also makes his robot body click into place. It’s a one-step transformation that immediately delivers his robot mode. You have to adjust the ankles and the robot hands a bit, but it’s a pretty efficient and elegant transformation. And in the space behind his robot head is a small recessed compartment where his gun can fold and be stored into in beast mode. I didn’t even know that the original Terrorsaur toy even has a collapsible gun, so this was definitely a massive treat to me. The blues and blacks translate pretty well into Strafe’s robot mode, and while it’s not a particularly vivid or colourful paint scheme like many of the Beast Wars toys, it’s still a pretty nice one. I do like the dark blue they used for him. Strafe’s robot mode looks pretty sleek and imposing, between the sleek metallic-looking robot limbs and the leather wings that splay out from his back, all Seeker-like. It has a remarkable degree of similarity to Terrosaur’s CG model, and the sculpting is generally brilliant. Articulation rivals many of modern-day toys. Sure, he doesn’t have a waist joint, but he’s got everything else. The head, shoulders, elbows, thighs, knees… they’re all ball-jointed, and both the wrists and ankles are hinged. It really puts into perspective what they could do ten years ago, and makes me lose a fair bit of respect for some of the less spectacular modern-day toys. Strafe is a bit back-heavy thanks to the dinosaur head ending up on his back, but he’s got a fair amount of stability thanks to his feet pointing both backwards and forwards. Strafe can strike a decent amount of poses. You can have him hold his little gun, but it’s cast in the same shade of blue as the rest of him so it kind of gets lost visually… but if you have a couple spare Terrorcon toys, you can lend Strafe their crossbow accessories, because by sheer coincidence the pegs fit. And since the actual Age of Extinction Strafe has a crossbow, well, why not let his smaller cousin have one too? Overall, Strafe’s robot mode is just gorgeous. No denying it. Transformation Design: 7/10 I wished they had done something to allow his robot mode legs to hide better in beast mode, and perhaps making a transformation scheme that isn’t so reliant on a spring mechanism would work, but as it is, it’s pretty serviceable. Durability: 9/10 It’s reportedly pretty good from the ten-year-old loose Terrorsaurs out there, but I fear that the tiny gun can either get lost or broken. Plastic wise and mould wise it doesn’t feel loose or hollow or whatever. Aesthetics: 8/10 I do love Strafe. His robot legs do mar his beast mode a bit, sadly, but other than that he’s a pretty awesome-looking toy. Articulation: 10/10 Ball joints! Ball joints everywhere! Strafe is a very poseable toy. Fun: 9/10 I did have quite a bit of fun with him. I do like Beast Wars toys and Strafe certainly doesn’t disappoint. We get an extra legends class Bumblebee, repainted off the ROTF version of the toy, which isn’t bad at all. I never owned this mould specifically, but I’ve heard wonderful things about it back when it was released in 2009, a good five years ago (holy crap). I didn’t really need another Bumblebee, but whatever. This particular variant may or may not have been released in the fifty or so different Bumblebee repaints over the four movies. Surely you guys don’t need me to introduce Bumblebee to you? I’ll rant for a full day if I start. So I won’t. 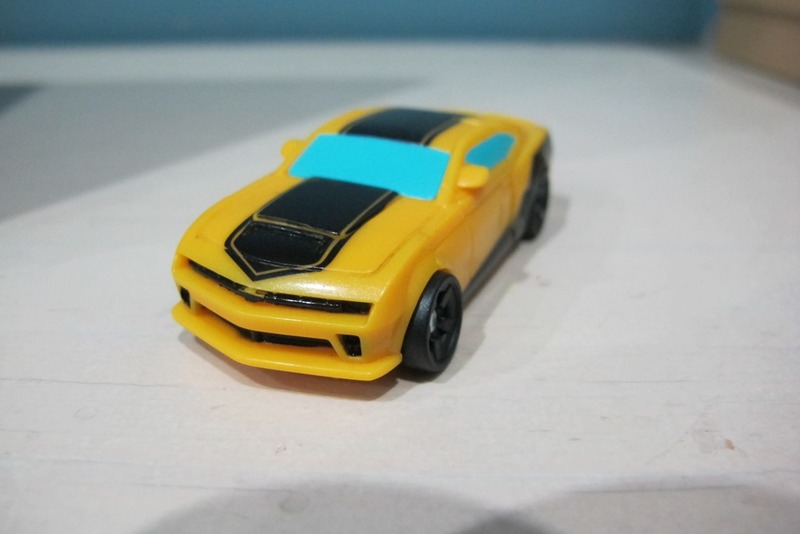 It’s the ROTF toy, so Bumblebee transforms into the 2009 concept Chevrolet Camaro. Bumblebee is painted in a dark-ish shade of yellow, with black racing stripes and baby-blue windows. It’s a brilliant sculpt that is basically a tiny version of a licensed car… it just screams ‘Camaro’. Having seen a massive quantity amount of Bumblebees over the years, though, I’m not a big fan of how the windows look. It’s just so neon and stands out a tad too much. The racing stripes aren’t exactly accurate to the movie’s prop car, but then none of these repaints generally are. This particular Bumblebee has taken to having one big chunk in the center bordered by a black rim, as well as a single black stripe on each side. It’s not a bad variation of the Bumblebee racing stripes, but the blue windows just kill the look. It rolls around well, though. It’s a nice little car with ugly windows. Transformation is highly simple, but results in a nice little robot. It obviously doesn’t look 100% like the show model, accounting on how tiny it is. The hands are moulded onto the inner sides of the doors, and the legs are basically chunks with details sculpted on them. With the lack of neon blue, Bumblebee looks fairly better here, since he resembles a simplified version of the movie’s CG model quite well. I’m not sure why his face is painted white, though. His face is white and his soulless eyes are painted in the same godawful baby blue. The rest of him is pretty cool, though… the colours translate quite well and the sculpting is pretty great – his stomach and hip area have a surprisingly large amount of detail for such a tiny toy. 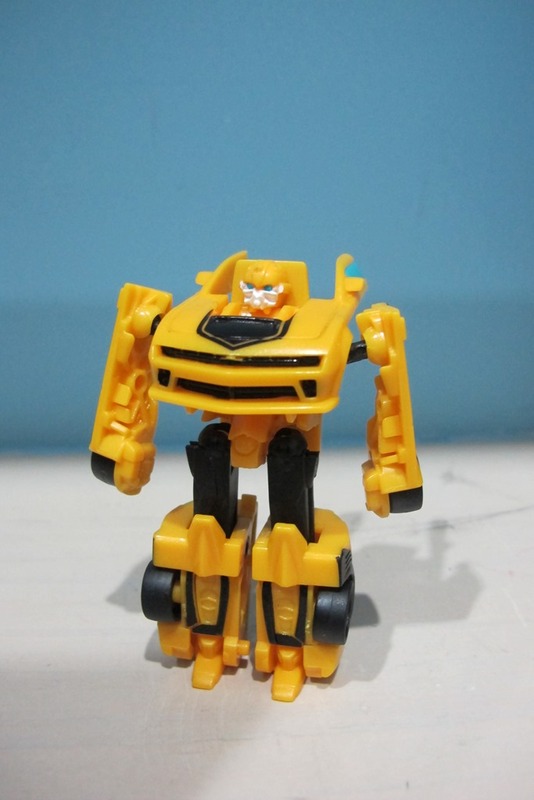 Bumblebee’s got decent articulation for a tiny toy, having ball-jointed arms and thighs. I generally don’t have much to say about this tiny Bumblebee… colours aside I can’t really pinpoint anything particularly wrong about it, but at the same time I won’t be sorry if, say, I woke up tomorrow and found out that this Bumblebee has gone off to act in Toy Story 4 or whatever. Transformation Design: 8/10 Given the size class and price point, Bumblebee’s transformation scheme achieves what it needs quickly and efficiently. Durability: 8/10 Bumblebee hangs out with his bigger brother from the HFTD toyline on the top shelf, and when I placed him there he fell down onto the floor, none the worse for wear. Plastic quality’s pretty good then. Aesthetics: 6/10 He looks like Bumblebee in both sculpt and colours, but the neon blue and the white face and the soulless dots of eyes drag this score down. Articulation: 6/10 It’s nothing spectacular, it’s decent for a toy of his size. Fun: 8/10 It’s certainly fun absent-mindedly fiddling around with this little toy while watching a movie, I must say. He can ride around in TerrorStrafe too, which is an added bonus. Price/Value (as a set): 6/10 It falls a bit on the expensive side thanks to the Terrorsaur mould being a basic class toy – equivalents to Scouts class of the past or the Generations-era Legends class – and Bumblebee is a legends class toy. By my calculations it falls a wee bit on the expensive side, but then it being a Terrorsaur kind of offsets this personally for me. Overall (as a set): 8/10 Both Terrorsaur and Bumblebee are both the highlights of their respective size classes when they went out, ten years ago and five years ago respectively. It’s certainly worth the admission fee to get two of the toys generally considered the best of their respective size classes during that time, and I certainly feel extremely happy that I finally tracked down such a gorgeous looking repaint of a Beast Wars toy… I do like this Strafe better than his modern counterpart. I certainly endorse this insane two-pack, since the only real detractor is the slightly steeper price point than normal.